i b i k e l o n d o n: Has Coroner put brakes on Boris's blue bike lanes? Has Coroner put brakes on Boris's blue bike lanes? 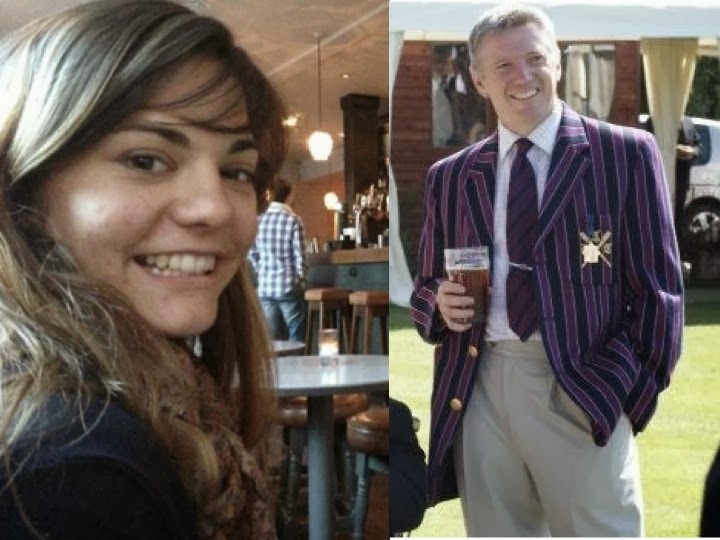 A Coroner's inquest in to two cyclist deaths on Cycle Superhighway 2 has led the future of the Mayor of London's flagship cycling scheme in doubt. Brian Dorling, 55, died in October 2011 in a collision with a lorry on the notorious Bow roundabout, whilst riding to work at the Olympic Park in Stratford. In July of this year French student Philippine De Gerin-Ricard, 20, was the first person to be killed whilst riding a "Boris Bike", after she was hit from behind by a lorry on CS2 at Aldgate Gyratory. This week's inquests revealed that Transport for London were repeatedly warned their designs were unsafe for cyclists, but that these warnings were unheeded. Families of both of the deceased were at Poplar Coroner's Court this week to hear from expert witnesses, the Police, and the lorry drivers involved in both incidents; as were press for local newspapers, London's Evening Standard and reporters for both ITV and BBC news. This was a very difficult and very public occasion for the families seeking to ensure similar events won't happen again. Ms De Gerin-Ricard's mother watched as CCTV footage of the moment her daughter was knocked from her bike, dragged along the road and killed by the lorry was played in the Court. 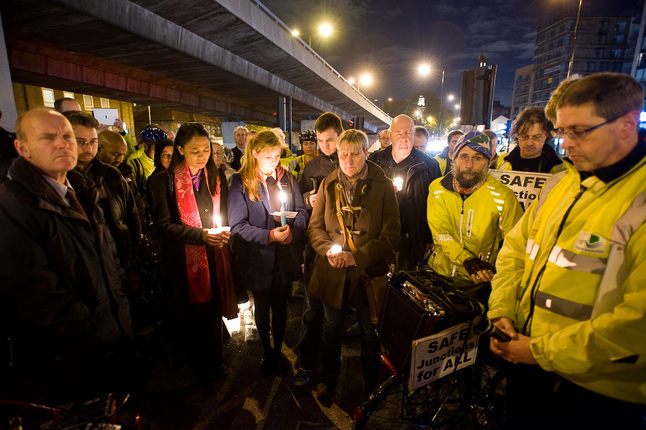 Widow Debbie Dorling leads a candlelit vigil in 2011 on the spot at Bow roundabout where her husband was killed. At Bow roundabout Transport for London ignored their own consultant's report (Jacob's) which said the site was so dangerous that traffic signals and separated lanes for cyclists should be installed. The London Cycling Campaign were so worried about the design proposals for Bow that they wrote in the strongest possible terms; "the apparent deficiencies in CS2 are so significant that it may be better to re-consider this route". Their concerns were also ignored. This comes after previous revelations that Transport for London told consultants to "ignore cyclists" at a dangerous junction in Kings Cross where a report stated vulnerable road user deaths were "inevitable". Student Min Joo Lee would later be killed at this spot whilst cycling to college, in a collision with a construction lorry. This week's inquest exposed that Transport for London also ignored warnings from the Met Police that CS2's design could potentially put cyclists in danger. PC Simon Wickenden from the Traffic Management unit said "The advantage is that it [blue paint] highlights the potential presence of cyclists to drivers... The disadvantage is quite clear. One; it places cyclists in a position on the roundabout where they may come in to conflict with traffic. Two; it may give cyclists a false sense of security." Revealing that a list of 21 concerns about cyclist's safety at Aldgate gyratory issued by the Met in 2008 had also been brushed aside by TfL, he said "In my view it would be safer not to have these markings at all on the roundabout." Bow roundabout - a place where we people live, work and travel on foot and bicycle, not just a transport corridor. The comments of Transport for London at the inquest stood in stark contrast to the hyperbole with which they launched the Cycle Superhighways programme. In 2009 Mayor Johnson stated "Superhighways are central to the cycling revolution I'm determined to bring about. No longer will pedal power have to dance and dodge around petrol power - on these routes the bicycle will dominate and that will be clear to all others using them. 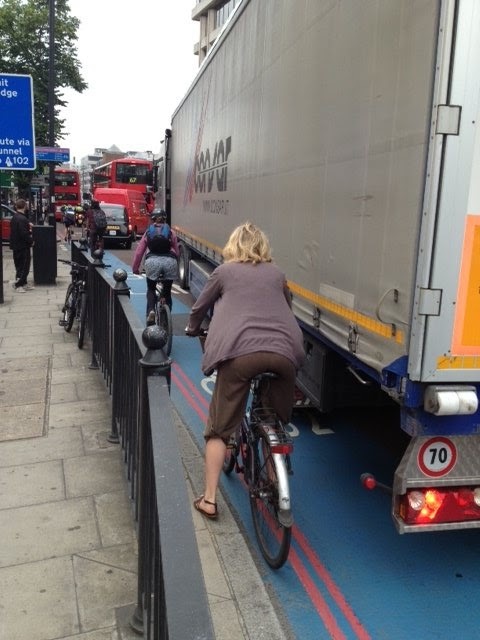 That should transform the experience of cycling..." At the Coroner's Court this week the director of the superhighways programme, TfL's Ben Plowden confirmed the blue paint on CS2 had no legal standing and stated "I'm not a designer... I'm not an expert in design". Plowden admitted designs drawn up for separated lanes and toucan crossings for cyclists at Bow were discounted by TfL because they would cause delays to motorised traffic deemed to be unacceptable. As focus intensified on the shortcomings of the design of the Cycle Superhighway which was eventually built, TfL's QC Keith Moon tried to deflect attention away from his client, suggesting that Ms Gerin-Ricard's lack of a high visibility jacket and a helmet (as she rode a Boris Bike) were contributory factors in her death. It was revealed that due to the location of CS2 on the carriageway and the design of the lorry and its inherent blindspots she would only have been visible in the driver's mirrors for 3.7 seconds. Continuing their boisterous defence, TfL's Nigel Hardy said despite this, the design of CS2 had passed all the body’s safety checks. As I told ITV news this week; "Not all Cycle Superhighways are born equal. Some are fully separated from the road, some of them are mandatory cycle lanes where you have a solid white line, and some of them - as at Bow roundabout and on Whitechapel Road - are just blue paint; that's it. Nothing that's going to keep you safe and certainly nothing that is going to protect you from a lorry turning across your path." Coroner Mary Hassel described the arrangements at Bow as "an accident waiting to happen" In the case of Aldgate her investigation exposed that TL's re-design of the street in to a 3-lane gyratory had left the inside lane (on top of which the blue Superhighway had been painted) just 3 metres wide. Ms Gerin-Ricard's Boris Bike was 67cm across at the handlebars. The lorry which killed her was 2.4m wide. Simply put, there simply wasn't enough room on the road for both of them. Ms Gerin-Ricard's mother, speaking outside the Court, said that her daughter was the victim of dangerous road design; "The accident Philippine had was the straw that broke the camel’s back. There is a problem with cycle lanes. If anything had been done, it hadn’t been helpful to cyclists. When quizzed on the Coroner's findings, Boris Johnson stated he believed that his blue cycle superhighways were "the right solution for London" and that he was determined to press on with the installation of another 12 over the next 2 years. "What we would like, of course, is to have cyclists in a separate cycle lane. It would be safer for cyclists, and motorists wouldn’t have the potential in the same way for this appalling experience of perhaps colliding with a cyclist... .. ..There will be more and more cyclists, and that is what we want. We have to find new ways of trying to keep them safe." A vote of thanks to journalists Tom Edwards at the BBC, Ross Lydall at the Evening Standard, Kaya Burgess at The Times and Luke Hanrahan at ITV London who sat through the three days of inquests and provided much of the copy quoted in this post. Except that the Dutch ALREADY HAVE thought of it, years ago. There really is no need to reinvent the wheel, just copy the whole thing, the entire dutch system, including their superior design for car roads as well as bike lanes. This post has made me sad and angry in equal measure. Seeing the faces of people who died in preventable incidents is heartbreaking - lives taken, families torn apart. But ultimately the reason is: "separated lanes and toucan crossings for cyclists at Bow were discounted by TfL because they would cause delays to motorised traffic deemed to be unacceptable." These deaths are unacceptable. This can't, mustn't go on. So TFL had a choice, delay motor traffic or kill some cyclists. They made a choice to kill somebody. Surely that is at the very least Corporate Manslaughter. Great post Mark. I think the criticism of TfL is entirely fair. Whist road engineers like Ranty, and Jess rightly say they are being put into a very tricky situation by the system, I think it is fair for us as citizens to criticise the whole set up of TfL. I work as a lighting designer, and some of the stuff we do is dangerous; working at height and with electricity (at the same time!) I have a responsibility to ensure that both the public, and my staff are kept safe. Legislation has made it clear that cost and time are not reasonable excuses for endangering people. In fact there are no excuses or mitigating factors for doing so. I wonder are road engineers unique in the UK for being able to design without having safety of users as the number one factor in their designs? Engineers and designers have made it clear that 'network assurance' is actually given higher priority than safety. I for one think that is utterly unacceptable in our society. work a west to east cycle route from Mornington Crescent/Hampstead Road to Crowndale Road was explored. It was found this would require additional traffic signals and for all traffic to be stopped for a short period to allow cyclists to progress safely through the junction. The traffic impact of these changes was assessed and led to unacceptable delays to buses and general traffic.